Last night, I happened to be driving home from teaching my Wednesday night guitar class. 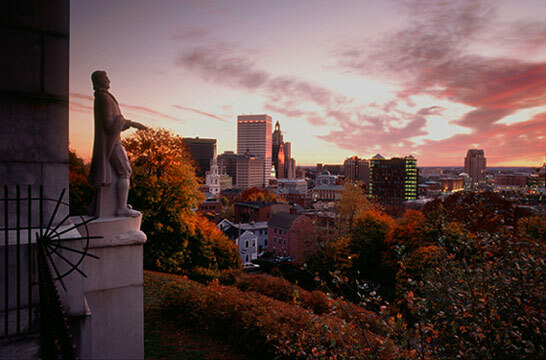 The school that hosts the class is located on the East Side of Providence, Rhode Island. The East Side is a venerable old neighborhood that’s roots go all the way back to the time of founder Roger Williams, circa late 1600’s. I grew up in a working-class neighborhood not more than a mile from the East Side, but have lived in a different city for some time now. Until recently, it had been many years since I have had occasion to travel these streets. I have found myself rather enjoying it. The East Side has changed dramatically over time, but still somehow magically retains its old-worldness. And I have surprised myself with how utterly familiar everything still is; the roots run very, very deep. In 1952, my expectant mother, who had grown quite tired of trying to choose a name for me, finally decided to name me after the very next street-sign she drove past (a hopeless romantic, my mom ). It so happened to be the one we lived on, Roger Williams Ave; thus making me into a namesake of sorts, even if in a somewhat second-hand fashion. Better a tarnished pedigree than none at all; I accept it now in the spirit that it was offered. Street-sign royalty. This would have taken place well before King Philip’s War broke out, at which time a trip down that woodland path would have been precarious at best. And last night…I found myself at the intersection of Hope and Angell, waiting for the light to change; when I was suddenly struck with the reality of how many thousands of times I have done this same simple mundane task before, and how nothing had really changed over the likely twenty-five years since I had done this last; and how utterly comforting that was, like a favorite old flannel shirt on a cold winter day. I remembered sitting at this very same light, on a bright summer morning. My father was driving his blue 1960 Chevy station wagon, the only non-Ford vehicle he ever owned. I was in the passenger’s seat. I was about 16 at the time, and had been conscripted to spend the summer housepainting with my dad. We were on the way to work. And my dad was telling me a story while waiting for the light to change. I clearly recall being thoroughly disrespectful and horribly rude… but he told me the story anyway. When he was very young, around 8 or 9 years old ( circa 1923-24 ) he and his friends would ride their bikes over the bridge and up Angell St. to this very same traffic light…to watch the light change. They would sit for hours, and watch the light change. They couldn’t figure out how it knew when to change colors. It was the first electric traffic signal ever used in the state of Rhode Island. To Irish immigrant kids in the 1920’s, it was magic. To the horrible teenager in 1968, it was an unwanted, unsolicited, extremely annoying anecdote. To the guitar teacher in 2013, it was a surprisingly potent and poignant uncovered memory. Thanks for the visit, Dad…it’s good to be reminded of how things can, and should, change. Woodland paths, traffic lights…and especially the people who use them. Sorry that it’s taken me forty years to connect those dots. And thank you for not leaving me on the side of the road that day, as I so truly deserved. Loitering? Is that what they’re doing? Another Sunday at work, and I am spending the morning watching local wildlife on security cameras. When people aren’t around, there is usually a remarkable variety to be able to observe. Today, it’s turkeys. About 40 of them. I think it must be mating season. The males are all circling and parading around in full plumage, very concerned as to who is standing where, and what the girls are doing. The girls apparently couldn’t care less. They will allow themselves to be herded together, or gathered, or whatever this is. But as soon as the males circle out just a bit too far, they will either wander off, or will go and join another pre-herded group. The males are seemingly very territorial, and keep some sort of pre-measured distance from one another. Which indicates… that the girls are doing it on purpose. This, I think, is the turkey equivalent of human girls in night clubs going to the bathroom together; it’s just meant to re-arrange the arrangements that the males think have already been made. And even though the males are quite wary of one another, they are very suddenly now doing something that reminds me of a Civil-War era infantry line; an albino turkey has just arrived, and is literally being driven away from the group by four males who have formed a perfectly straight shoulder-to shoulder wall, and have forced the albino far off to one side. This is extremely politically incorrect. There is apparently no level of equality among turkeys at all. I wonder what they are finding so objectionable. Now they have returned to their original positions; the albino circles around for a flank approach; the girls have taken advantage of the interruption to disband completely, and it looks like the entire process begins anew. That may have been the albino’s plan all along. I wonder how long this elaborate process takes to complete; hours…days…weeks? I also hope that what I’m observing is actually a formal process of some kind. It would be very weird to consider that they’re just hanging out on a Sunday, and this is what turkeys get up to when no one is around. Well, they’re moving off into the woodline now. Maybe they just come out in the open for the sake of the dance, and then take the rest of the day off.